In natural landscapes, rain that falls on the ground mostly soaks, or infiltrates, into the soil. However, in urban areas, impervious surfaces such as roofs, pavement, and streets, prevent infiltration. As rain and excess irrigation water flow over these paved surfaces, they can pick up pollutants and carry them into local storm drains, local creeks, and the Bay. Cities and towns in Santa Clara Valley are working together to create sustainable or green streets, buildings, and parking lots that mimic natural landscapes, by incorporating green infrastructure. These features allow rainwater flowing over buildings, streets, and parking lots to soak into the ground and be filtered by soil. This reduces the quantity of water and pollutants flowing into storm drains and local creeks. This page provides videos, technical guidance, and other resources to help implement green infrastructure projects for rainwater harvesting (rain barrels, cisterns, rain gardens, and more) and stormwater management (bioretention areas, bioswales, green roofs, permeable pavement, among other options). At the scale of a city or county, green infrastructure refers to the patchwork of natural areas that provide habitat, flood protection, cleaner air, and cleaner water. Projects may include wetland preservation, protection of open spaces, and curb cuts to help redirect rainwater from the street into landscapes. At the scale of a neighborhood or project site, green infrastructure refers to stormwater management systems that mimic nature by soaking up and storing water. Projects may include permeable parking lots and green roofs. At the residential scale, rain gardens that treat and temporarily retain runoff from downspouts and driveways are the most applicable and accessible type of green infrastructure to install yourself. Projects may include rain barrels and rain gardens. Green infrastructure provides many benefits to the community. In addition to improving water quality, green infrastructure is also viewed as an outlet to create or enhance recreational and public use areas by creating attractive streetscapes and habitat, reducing the heat island effect, and increasing accessibility for multiple modes of transportation. Click here for examples throughout Santa Clara County to inspire your own projects! For an overview of these exciting opportunities to conserve water while creating healthier ecosystems within our communities, click here. Or click here for a more technical yet accessible overview. 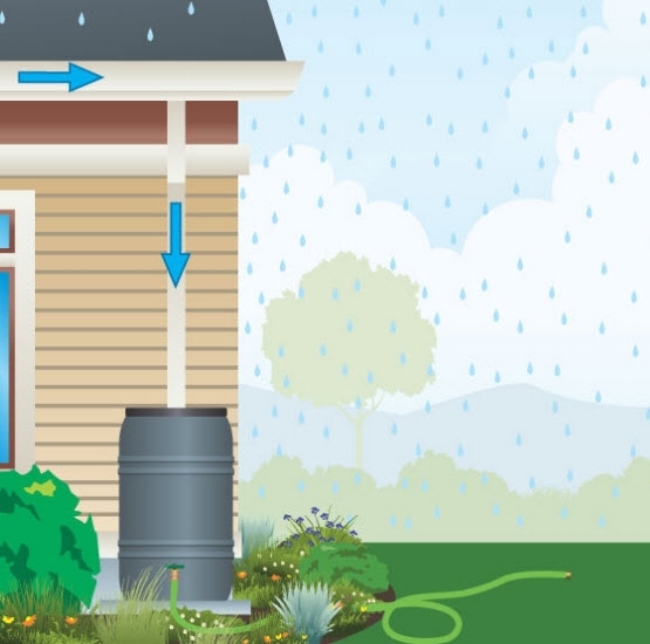 Your yard can actually retain and clean rainwater. Capturing and storing rainwater reduces the need for irrigation with precious drinking water. Using permeable pavement, rain gardens, swales, or dry creek beds, you’ll help reduce peak runoff during rain events, allowing the soil to soak up rainfall and give soil microbes a chance to filter some of the pollutants. These features may also add a unique, creative look to your landscape. Or, with proper permitting, rainwater can be captured and used indoors for flushing toilets or even washing your clothes. Rain barrel and cisterns for smaller projects. For general Rainwater Harvesting info, please click here. For more information on green roofs, rain gardens, infiltration trenches, pervious surfaces, creek-friendly improvements, and other stormwater improvements, click here. Breaking Up is Easy to Do - Permeable Hardscape Overview from the CA Water Board. Still have questions? Check out the UC Master Gardener’s rain garden blog for additional overviews, resources, and guidance. The following resources developed by the Environmental Protection Agency (EPA) is geared toward municipalities to assist implementation and evaluation of rainwater harvesting, stormwater management, and other green infrastructure. Enhancing Sustainable Communities with Green Infrastructure to help communities better manage stormwater while achieving other environmental, public health, social, and economic benefits. Tools, Strategies and Lessons Learned from EPA Green Infrastructure Technical Assistance Projects to provide practical, successful solutions to inspire city managers, community leaders and engaged citizens looking to design their community space for better health, abundant water resources, and improved quality of life. Water Quality Scorecard [PDF] was developed to help local governments identify opportunities to remove barriers, and to revise or create codes, ordinances, and incentives for better water quality protection. California Stormwater Quality Association Resources. This Technical Assistance Memo provides plant selection guidance for the most common bioretention features, such as bioretention swales and stormwater planters: Low Impact Development for Plant Guidance for Bioretention. Central Coast Low Impact Development Initiative - a variety of resources, located here.